iWindsurf Community :: View topic - Fin box repair? Posted: Sun Aug 26, 2018 9:09 am Post subject: Fin box repair? I just finished a great foiling session will post a video on a different thread. 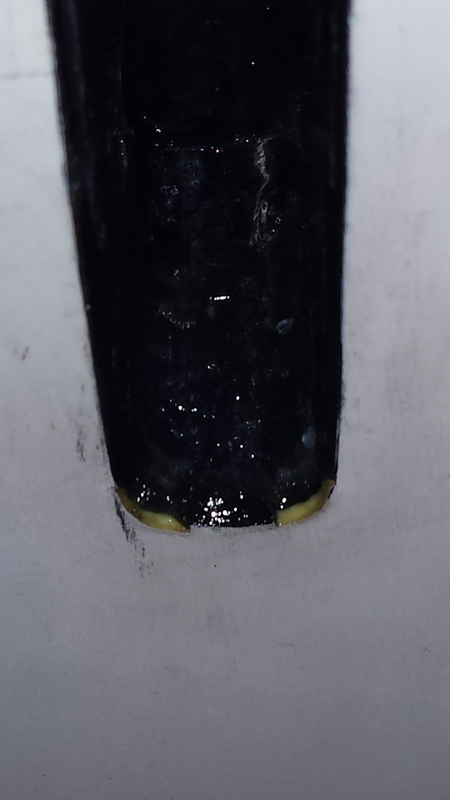 But after realizing I can see two tiny spots of what looks like yellow foam at the front bottom of my fin box on my beloved sb formula 162 ( SEE PICTURE). This makes me confused because that would mean the fin box is super super thin at Least right there it is. Like 1 millimeter thick. Unless you have a foil box in your board there is a good chance the deep tuttle box will not hold up. Fix this right away. I had an even smaller crack at the edge of a slalom board that I ignored for a while before fixing it. A little while later, the entire bottom delaminated, quite possibly because some water got it at the little crack. Figured something would happen to the fin box eventually since it's not renfoceied , did not think it would be after my 4th sail with the foil. I have the rs:one aluminum without a flang. The strength of the box seems good - except for that one tiny area where the box meets the bottom of the board as you can see in pic The two yellow spots. I have never repaired anything on any board before. I was thinking of using epoxy to fill that area and maybe strengthen it up with some sort of carbon or fiberglass material? On the down side if I do not fix it good enough it could make more damage to that area of the fin box. If anyone who has experience with these kinds of repairs or has had this happen to then could comment. Strap board down, install your foil, and have someone bend the mast sideways and back n forth while you carefully inspect for movement damage. Appearances can sometimes be deceiving. If there is separation from applied force, rout in full depth woodies wrapped in glass and double layer the bottom around the box overlapping 9". You can insect leg 2" woodies 4 in the sides and one each front and back. I'll check our F-162 box with 40 foiling days, but we use a PowerPlate to spread the loads of foiling. dont inspect...That whole box shifted.....maybe cracked. GRIND !!! And Tell CRAZYFINGERS to juice his board as well.... before he suffers a similar...and quite predictable fate! Who is the "Amphibious Rodent in Ontario". I don't think it is as bad as your making it out to be. If the box shifted or cracked I think I would have notice other things other then a very small peice of the box chipping where the fail makes most of its stress. I think however I should strengthen the area where that happened with some fiberglass glass or carbon cloth. But will put ding stick epoxy to seal that part up. Not saying that this will be a fix that will that 5 years or more but sounds better then ripping out the box that may not be broken. Has anyone put fiberglass or carbon cloth on the inside of a fin box before. Feel like it could give me a bit of a better fit. After looking in the fin box it seems that the front top has slightly more material then the bottom front half. Don't know if it was sanded by previous owner to give the fin a better fit. A sharp knife and a small framing hammer can open up a 1/8" slot along the finbox, but a router with small blade is better, or a vibrate multi function tool. Then shove the cloth in with a dull knife. But stronger is adding woodies, either along both lengths and front and back, or just insect legs. Sorry I'm new to repairing boards. What are woodies or insect legs. Did you get this info from a website or is there a video link I should be aware of? All the videos I can find are ones of guys replacing fin boxes. I built surfboards for 20 years of my surfing career, shaped about 300 surfboards, finished 200. No videos in the '60s, but somehow things got done and progress occurred.